Slight diffences in the base voltages of the transitors result in substantial differences in the collector voltages. If Vin+ > Vin-, the collector current through the left transtistor is greater than the collector current through the right transtistor. Hence Vout+ >> Vout-. Contrarily, if Vin+ < Vin- then Vout+ << Vout-. For the experiments extra wires, like the one that connects the emittors, are necessary. See the video. Connect the plus pole of a multimeter to the collector of the right transistor. Connect the minus pole of the meter to the collector of the left transistor. 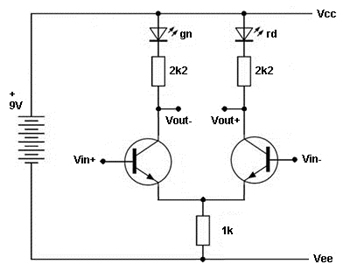 The collectors of the transistors form the output of the differential amplifier. The bases form the input. With open bases the transistors are not conducting, the LED's are off and the difference between Vout+ and Vout- is close to zero, as shown on the multimeter. Hold a (wet) finger against the top left three pins of the connector of the left circuit block. The base of the left transistor, being the positive input of the differential amplifier, becomes positive. This results in current flowing through the left transistor. The green LED comes on and Vout- drops below Vout+. The output voltage of the differential amplifier, as measured on the multimeter, rises to as much as + 4 to 5 Volts. Hold a (wet) finger against the top left three pins of the connector of the right circuit block. This gives the opposite effect. The negative input of the differential amplifier becomes positive. The red LED comes on and the output voltage measured on the multimeter drops negative to as much as - 4 to 5 Volts. Connect the bases of both transistors to each other, using a wire between the b's on the left and right connector. The output stays zero, as can be expected of a differential amplifier. Connect another wire to one of the b's on the middle connector. Touch this wire with your hand, connect it to the positive battery terminal (Vcc), and connect it to the negative battery terminal (Vee). In all this situations the output should remain close to zero volts. This is indeed the case. There is so called "common mode rejection". However temporary unbalance can occur, which can be seen by flickering of the LED's. Now remove the connection between the bases and connect the 27k resistor of the left block to Vcc. The green LED comes on and the output voltage measured on the multimeter becomes 5.3 V. Only one transistor is conducting. 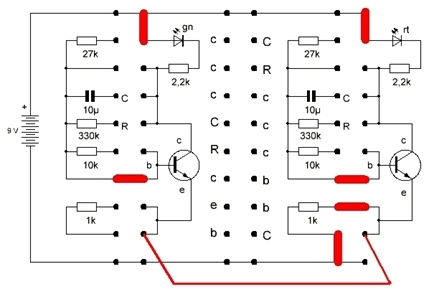 Connect the 27k resistor of the right block to +. The red LED comes on too. The transistors are now both conducting at their maximum. The output voltage becomes 0.0 V again. Now connect the 10k resistors of both the left and the right block to Vee, using wires. You now have created voltage dividers for the Vb's of the transistors. They are partly conducting now, being half way their caracteristics. The output voltage as measured on the meter is close to zero volts, but not perfectly as you would expect of an ideal differential amplifier. This unbalance is due to an unbalance in the components, especially in the gains of the transistors. You can demonstrate this by warming up the transistors with your finger. Warming up one transistor gives more balance. Warming up the other less balance.